Supermax MAX-1 mdl. YC-VMC-60A CNC Vertical Machining Center s/n 805456 w/ Fanuc 11M Controls, 16-Station ATC, BT-40 Taper Spindle, 5000 Max RPM. 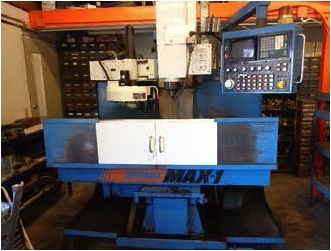 1996 Romi – Bridgeport Power Path 15 CNC Turning Center s/n 016-001881350 w/Bridgeport DX32 Controls(Recently Upgraded), Tool Presetter, 12-Station Turret, Hydraulic Tailstock, Power Chuck, 5C Collet Nose. Taper Attachment, Inch/mm Threading, Tailstock, Steady and Follow Rests, Chucks and Faceplates. Power Draw Bar, Power “X” and “Y” Feeds, Chrome Ways, 9” x 49” Table. Niagra 48” Power Shear w/ Motorized Back Gage, 1/8” Mild Steel Cap. Jet mdl. BP-1248F 48” x 12GA Finger Brake s/n 0222055. Leland Gifford 3-Head Deep Hole Gang Drill. Benchmaster 4-Ton OBI Punch Press. Wells mdl. 600 7” Horizontal Band Saw. BT-40 Taper Tooling and Rack.